However, this situation changes entirely when we are talking about desktop gaming since there are so many things to take into consideration for choosing the right hardware – mice, keyboards, monitors, microphones, headsets, monitors, mouse pads, desks, and even gaming chairs. 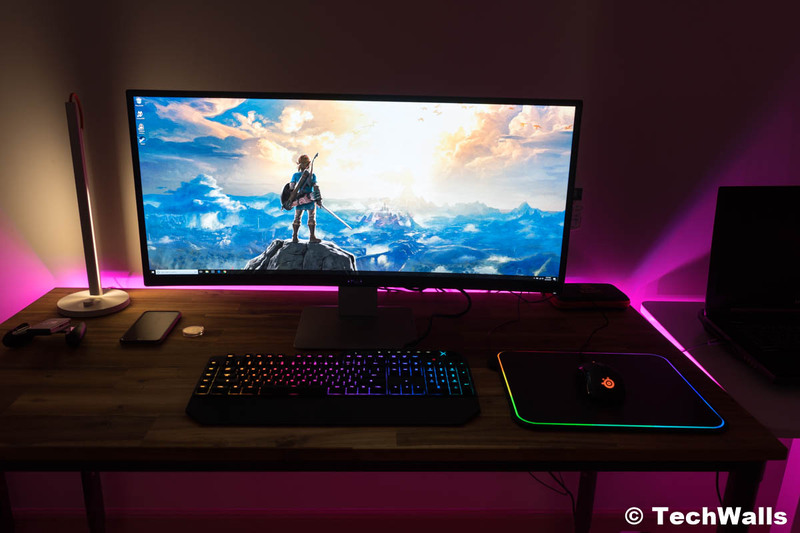 If you wish to learn more about the desktop gaming essentials, then let us introduce you to our list of essential peripherals for your desktop gaming needs. Only someone who has not tried playing any game or even working with a gaming mouse can say that there is no significant difference between an ordinary $20 generic desktop mouse, and a $60-70+ gaming mouse from a renowned manufacturer. Having a good gaming mouse is essential if you want to improve your gameplay – they provide you with the ability to be much more accurate with your movements, they give you access to additional keys, and they use state-of-the-art tracking technology, which can ensure that even the most minimal movements will be detected. It is also worth noting that gaming mice are used with drivers that allow you to fine-tune every little mouse setting. Gaming monitors tend to be characterized with low response times (usually 1MS), higher refresh rate (144Hz or above), and support for the FreeSync or G-Sync technologies. But what do you need one of those purchases? The response time determines how quickly pixels change their color and state – so, the lower the milliseconds, the better the result. Ideally, you should look for a monitor with a maximum of 5ms response time, while 1ms is ideal. The refresh rate used to matter a lot for first-person shooters, but nowadays 144Hz monitors are preferred by all gamers due to the smooth picture they provide. Last but not least, we have the FreeSync (AMD) and G-Sync (NVIDIA) technologies – they aim to synchronize the monitor’s refresh rate with the game’s framerate (frames per second), therefore reducing ghosting and screen tearing effects. The maker of your video card determines whether you should look or a monitor with FreeSync or G-Sync. Gaming desks have become popular in recent years, but they are guaranteed to become more widespread in the upcoming years. They are not expected to enhance your ability to play a game by a lot, but they may provide you with some fun and convenient features – easier cable management, integrated USB ports, built-in wireless charging, and even a surface that is aimed to work as a mouse pad. It is also important to note that they have an ergonomic design that aims to reduce strain on your body (mainly arms and hands) during long gaming sessions. Mechanical keyboards have made an incredible comeback in recent years, and purchasing one of those is the best way to treat your fingers. Every individual button of these keyboards works via a mechanical switch, which requires a specific amount of force to push it to work – depending on the mechanical switches you choose, you can have a keyboard that requires more or less actuation force to work with. The durability of mechanical switches should not be underestimated either, and a well-maintained keyboard of this sort can serve you for decades. Have you heard advice about buying a good mattress and boots because you either lay or stand on them for long periods of time? The same applies to your computer chair – you may end up spending an unhealthy amount of time there, so it is in your best interest to invest some money in a good office or gaming chair. They are more comfortable, but most importantly they are built with an ergonomic design, which greatly reduces stress on your body and minimizes the chances of complications from your long gaming sessions. Remember that you should not necessarily buy the most expensive keyboard or mouse – there are plenty of affordable brands that can give you a premium product. Just remember to research and read reviews, so you will make the right purchase in the end.